The sCharger-5 is very well received on all the hiking trails. It is the official solar charger on the PCT because it's only 7 ounces. Hikers love it! Most likely you have seen many sCharger-5's on the trails. It is very light weight and packs a punch with true output power. This is very important for the duration hiker. The sCharger-5 can charge your USB device directly from the sun alone. The sCharger-5 is very compact, easy to use. And it produces an incredible high power to low weight ratio. It also provides Auto Recovery. We call it Auto-Retry (Patent Pending). Overseas solar chargers over claim output power. Suntactics does not. What is stated is what you get. 1200mA. Over 5 Watts at 5 volts. 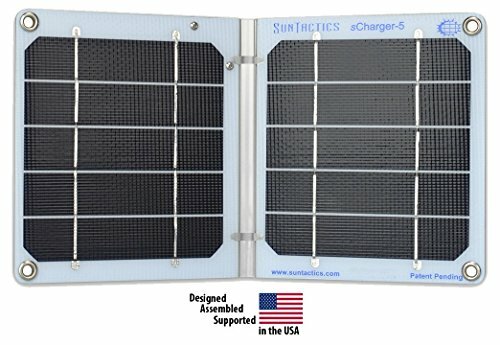 Suntactics sChargers are designed and assembled in Silicon Valley, California, We use only the best solar materials. And we use very high measures on quality with superior American workmanship. Our solar chargers may be a little pricy but they work and will perform for many years. We actually have a website and direct phone number unlike other Amazon sellers. Look us up and call us. sCharger-5, Travel bag, English user manual. Check out our sCharger 8 and 14 for even more power! Please be sure to read the Comments that go with our Reviews. And look us up on Fakespot. We recieve 100% true reviews. Extremely durable and reliable. Solar cells and electronic connections are completely encapsulated. Impact resistant, high compression substrate prevents stress failure. Other solar chargers use flexible cloth encasements and under continuous use the internal cell crack damage impacts their performance. Our high efficiency solar cells are configured correctly for optimum light-to-voltage conversion for increased charging speed. The circuits are sealed in silicon and tested to 40 feet of water and corrosion resistant. Suntactics solar chargers are impervious to moisture. Patent Pending Auto-RetryTM technology for charging devices during power interruptions like clouds. Suntactics sChargers will re-start charging within minutes after a power fluctuation. Designed and assembled in Silicon Valley, USA. Includes the Suntactics S5, travel pouch, User Manual and Quick start Guide, 2-year warranty, w/ 5 year option, excellent customer support. If you have any questions about this product by Suntactics, contact us by completing and submitting the form below. If you are looking for a specif part number, please include it with your message.